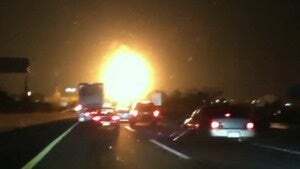 This glowing fireball is not the coming of Harold Camping's apocalypse but the aftermath of a collision between a tanker carrying 8,500 gallons of gas and a minivan, which took place on the New Jersey Turnpike last night. Citizen journalist @MelissaJoann was there and filmed what she saw; this image is a still from her crazy-looking video. At least nine people were injured during the collision, which stopped traffic for hours. Luckily, reports say that no one's injuries are "life-threatening." Update: ABC's coverage includes flaming hot FIREBALL FOOTAGE. Fast-forward to :53 to watch the FIREBALL FOOTAGE.